Industry Report on What is Tether? Industry Report on what is Tether: Background. There is no such thing as a stable form of money when you think about it. Even fiat currencies such as the U.S. Dollar and Euro are subject to inflation and diminishing purchasing power, but because these fluctuations are often so small, we still find them usable on a day-to-day basis. For cryptocurrencies, the daily fluctuations are amplified, making them impractical for mainstream use. While volatility fuels the use of a cryptocurrency as a speculative asset, it limits its usefulness as a medium of exchange. Cryptocurrencies made it into mainstream media when it was used as a tool of the dark web by the infamous Silk Road, which was shut down afterward. At the time, it was far from being an investment option for retail investors, but they soon fell in love with the price swings. Suddenly, bankers and financial institutions across the world had an opinion about cryptocurrencies. Everyone was talking about it. Volatility established cryptocurrencies as a potential asset that could one day go mainstream. However, volatility can also be a double-edged sword. It can attract investors when there is an upswing in prices as it happened in November 2017 when the prices shot through the roof. It can also lead to an exodus of investors, as it did this year, where it shed off more than 50 percent from its year-end price of $13,000. The ill effects of the price drops have also been felt in the market as it affected trading volumes and interest in the crypto market. To see a future where cryptocurrencies are used on a day to day basis, volatility needs to be tackled, and this is where Tether comes into play. Tether is a stablecoin that was created to be stable enough in its purchasing power or is at most slightly inflationary, to incentivize owners to spend rather than hold the tokens. In its simplest of forms, Tether, is a cryptocurrency with a fixed price measured by a fiat currency, in this case, the U.S. Dollars. Stablecoins like Tether are important for everyday transactions. Without stability, a seller will be skeptical of trading goods and services for fear of losing value due to price volatility—one of the reasons why cryptocurrencies haven’t been widely adopted yet. The likes of bitcoin, Ethereum and Litecoin have been used severally for transactions involving online payments. They have, however, not been reliable for making day-to-day transfers due to high volatility in price. Tether brings a comparative advantage which its predecessors have failed to bring to the table – value for value conversion of fiat currencies into crypto-coins thereby making it possible to facilitate trade with them. At its inception, it was issued on the Bitcoin blockchain before its transition through the Omni Layer Protocol to the Litecoin blockchain. As a project by main cryptocurrency exchanges, Tether ranks #15 among the highest market cap (around USD 2 billion). Tether is a hybrid crypto-fiat “stablecoin” whose value is pegged to the value of the U.S. dollar and other fiat currencies. It is a cryptocurrency asset issued by Tether Limited, and it operates on the Omni protocol as a token issued on the blockchain. 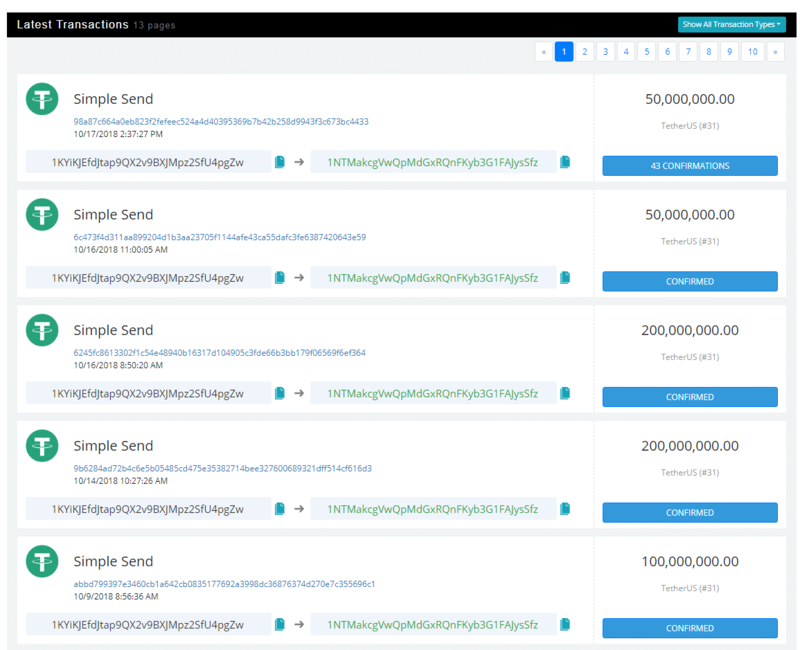 As a rule of thumb, every Omni transaction (Tether inclusive) is recorded in a Bitcoin transaction sharing the same transaction hash. With an overwhelming amount of USDT tokens already issued on the Omni network, Tether has the lion’s share among other coins running on the same protocol with over 90% of Omni’s transactions. Tether is the world’s most popular stablecoin, and it even acts as a dollar replacement on popular exchanges such as Bitfinex and Poloniex. Being backed by the USD means for every Tether issued, there is an equivalent amount of dollars kept in reserve. However, the U.S. Dollar is not immune to shifts in the world market’s paradigm and as such, subject to fluctuation. The import of tether currency is to help curtail the volatility of cryptocurrencies and enable the use of cryptocurrencies as fiat money by willing users. Thus, its value is not meant to be subject to variation as it ought to remain equivalent to $1. The Euro is also a currency Tether pegged its token to due to the control wielded by the European Union, who controls a large percentage of the world’s financial market as well. Having described it using an apt essence, there are some benefits for adopting Tether over other cryptocurrencies. Tether facilitates the transfer of real cash into digital cash. Considering the secured payments offered through the use of blockchain. It’s also faster to convert to cryptocurrencies than regular fiat. Tether also holds the ace when it comes to buying cheap cryptocurrencies when the market dips. A good number of platforms working with cryptocurrencies enhanced their platforms after they adopted Tether. Platforms that initially lacked the wherewithal to use the U.S. dollar, use Tether instead, allowing them to open up to new markets. The market stability of your crypto investment is ensured through the use of Tether as a backup fund. The amount of Tether in circulation is commensurate to the backup funds. Using a one-to-one ratio, Hong-Kong based Tether Limited holds fiat currency in reserves believed to be the equivalent of tether in circulation. In other words, Tether Limited serves as a trusted third party for the assets. The complexity of conducting both fiat and crypto audits is reduced by a simple implementation which does not affect the security and transparency of audits. 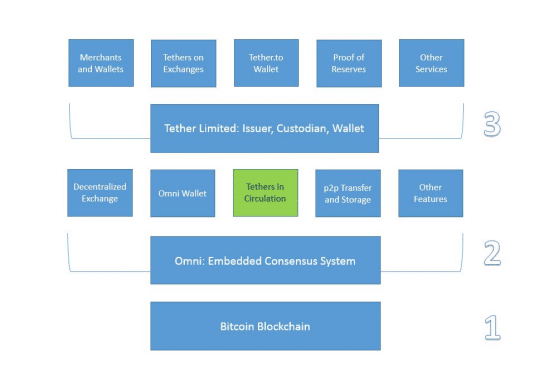 Tether operates on the Omni protocol which is a versatile platform used for a number of digital assets and currencies anchored to the Bitcoin blockchain. Every 1 USDT is worth $1, and it can be redeemable at any time for 1$ of fiat currency. That’s the idea, but it doesn’t work that way. In the same vein, an approved client who wires USD to Kraken’s bank account would receive USDT at the rate of 1$ per Tether. Users can also exchange their cryptocurrencies for Tether on a trading platform. Sequel to deposits made into Tether’s Limited bank accounts using fiat currencies, the company credits the user’s wallet with its equivalent in tether, thereby enabling the user to use tether as they please. However, since April 18, 2017, Tether had stopped receiving deposits in exchange for the token citing problems with its Taiwanese banks as the reason. There are questions on tether being described as a secure network and a decentralized system. Taking a look at its operation mechanism, it is obvious the system is dependent on the capability and willingness of Tether to maintain the currency peg. Assume a scenario where one of the exchanges can’t access the USD reserves allocated to customers willing to sell USDT, the onus, therefore, is on tether to supply the exchange with USD within a reasonable time frame. This also makes Tether more of an entirely centralized system which is in contradiction to what it claims. The primary purpose of Tether is to provide liquidity and a hedge against market volatility. The tokens are pegged to a fiat, which means there should be no loss of value or volatility as with other tokens. This also makes the stablecoin less risky than typical cryptocurrencies. Its relevance as an alternative to fiat is a big advantage that cannot be overemphasized cherished by traders and investors. For many investors, Tether provides an avenue to park their investments when the market is bearish, especially in countries where converting from cryptocurrencies to fiat is a hassle. The volatility of cryptocurrencies is a repute regarded with an element of notoriety, and this is where a stablecoin stands out as the ‘star bride.’ Those who enjoy this benefit the most are traders of smaller altcoins which have no readily available liquid market. There is a maze of complication and attendant risks involved in trading a volatile currency for another. You will appreciate the import of these complications by playing out this scenario in your mind. There have been allegations regarding the connection between Bitfinex and Tether in the media. Both entities share the same Chief Executive, chief financial officer, chief strategy officer, and general counsel. The recent Paradise Papers leak confirmed Philip Potter and Giancarlo Devasini as those behind the saddle, and observers, who have been monitoring the trend did not take this as a surprise. New Tether accounts flow mostly to Bitfinex and it, therefore, becomes easier to appreciate the import of why both companies experienced a freeze of their fiat operations following the withdrawal of US Bank and Wells Fargo as banking partners. Consequently, Bitfinex now refuses US customers as the markets it provides are no longer denominated in USD. Instead, it exclusively uses USDT. A research paper, titled ‘Is Bitcoin Really Un-Tethered?’ was published in June 2018 by two college professors John M. Griffin and Amin Shams (GRIFFIN and SHAMS*) from the University of Texas In the paper, the professors shed light on the driving forces behind the boom in crypto markets. The researchers argued that Bitfinex supplies the market with Tether regardless of the demand. They faulted this move, which they believe creates artificial demand for Bitcoin and other cryptocurrencies—pushing prices up, which is similar to the inflationary effect of printing more money. When prices fall, they can convert tether into bitcoin, in a way that pushes bitcoin up, sell some and replenish the Tether reserves. When prices fall, they have a “put option” on default on redeeming tether, or they can claim to have experienced a ‘hack’ to explain the disappearance of tether or related dollars. The plot below shows the printing events of Tether from March 2017 to July 2018, together with the cumulative printed tether in red, the surge in the price of bitcoin and the Bitfinex/Tether subpoena issuance on December 6, 2017. In this graph, bitcoin prices are obtained as 1-h candlesticks. One of the inferences from the plot is that the majority of the issuances of Tether seems to have happened around November 2017 to January 2018, just in time for the rise and burst of the bitcoin bubble. The hypothesis pushed by John M. Griffin’s publication is that tether was issued and sent to several exchanges to purchase bitcoin in response to market dips to create a false bullish market so other investors could join the bandwagon and buy more bitcoin. By mapping the blockchains of Bitcoin and Tether, we can establish that entities associated with the Bitfinex exchange use Tether to purchase Bitcoin when prices are falling. Such price supporting activities are successful, as Bitcoin prices rise following the periods of intervention. The researchers also described how Tether was frequently moved across the major participants on the blockchain. Once it is created, it proceeds to Bitfinex and then gets shipped out to other crypto exchanges. One of the fascinating reveals is that almost no tether returns to the issuer to be redeemed and the primary exchange where it’s expected to be redeemed is Kraken, which accounts for only a small portion of transactions. The researchers also ran a test to find a relationship between the major exchanges and between the top cryptocurrencies. To find the signed net amount of capital transferred between two parties transacting with Tether, the study ran a test using major tether exchanges, Bitfinex (BFX), Poloniex (PLX), and Bittrex (BTX) for the sample. Defining an equation for the net amount of bitcoins and tether transferred between the exchanges in each sample period. Using tether to define the value relative to bitcoin prices, the study used the bitcoin-denominated value of tether taking bitcoin prices at the time. The figure above shows the aggregate flow of Tether between the major exchanges from Tether genesis block to March 31, 2018. 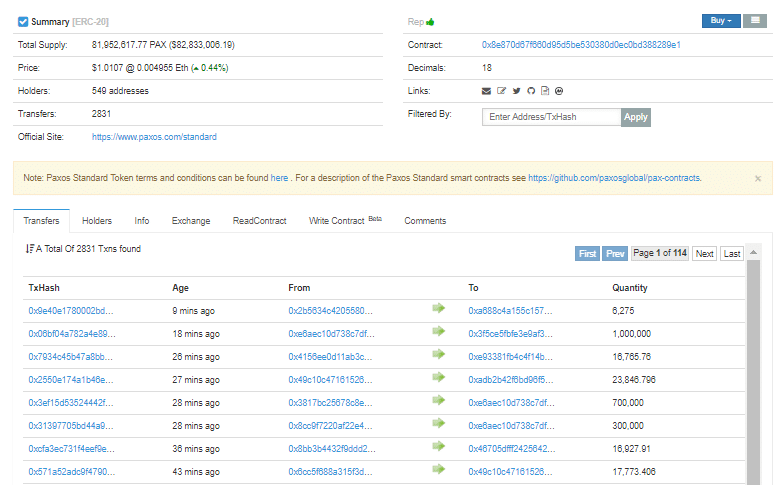 Every Tether translation is labeled as transactions with the coin ID 31 on the Omni Layer. 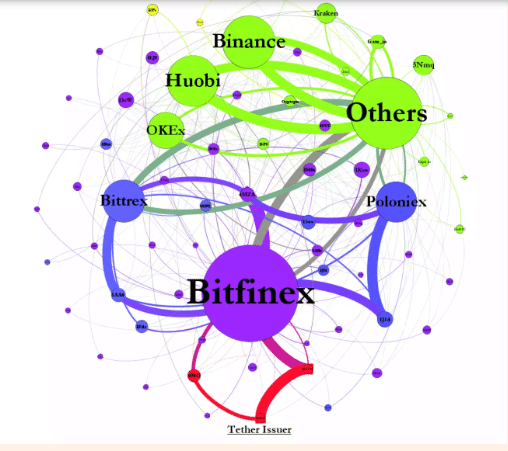 The identities of the exchange were obtained from Tether’s rich list, and the thickness of the edges connecting the exchanges is proportional to the size of the flow between two nodes. The curvature of the edges shows the flow of Tether from the sender to the recipient. Each node size is proportional to aggregate inflow and outflow for each node. The graph above gives a vivid insight into the structure of Tether and how it was issued. All Tethers printed by Tether Limited (the red node at the bottom) are first moved to Bitfinex. Everything starts from here before being distributed through the network. One interesting detail in the graph is the inflow back to the initial Tether node, which explains why it was impossible to sell tether back to the issuing company in exchange for U.S. dollars with the company claiming it was to prevent bad actors from taking advantage of the platform. Kraken, the small yellow node at the top of the graph, became the de-facto marketplace for trading USD-USDT pairs for 2017, even though the magnitude of Tether flow was significantly smaller than what was sent to exchanges to trade Tether for other cryptos, notably Bitcoin. Another interesting detail is the relationship between Poloniex and Bittrex, two of the largest exchanges for Tether and their close ties with Bitfinex through a massive flow of Tether in and out of Bitfinex using an intermediary address. The number of USDT in circulation grew by nearly 9,000% from February 2017, rising from approximately $25 million to more than $2.8 billion at the end of January 2018. From December 2017, Tether issued 775 million more tethers, which is a 52.5% increase in its total supply, right after Tether and Bitfinex were subpoenaed by the United States Commodity Futures Trading Commission (CFTC) on December 6, 2017. The Griffin and Sham study revealed that Bitfinex sent 2.99 billion Tether to Poloniex and Bittrex until February 2018, while the two exchanges sent back 1.89 billion to Bitfinex, keeping the remaining 1.11 billion Tether sent initially from Bitfinex. Kraken, the designated marketplace for trading USD-USDT pairs had an unusual movement, that raised red flags. According to the report on Bloomberg titled “Crypto Coin Tether Defies Logic on Kraken’s Market, Raising Red Flags” on June 29, 2018, Tether’s price was not responding to the market economics of supply and demand. 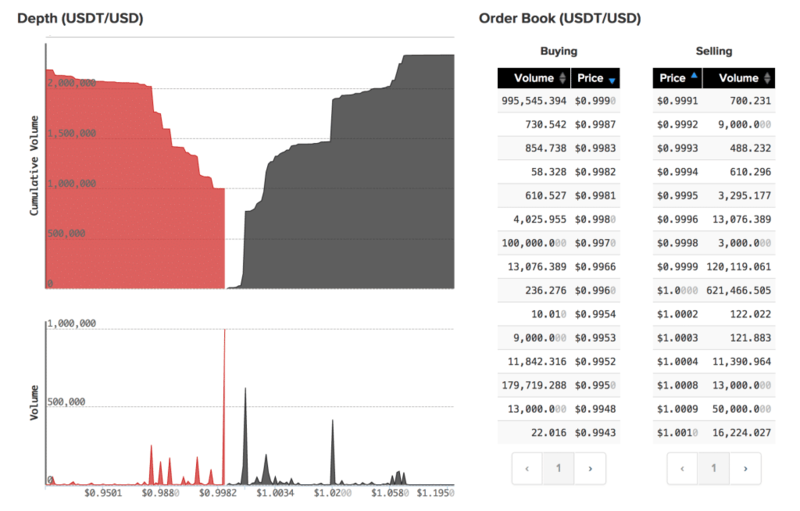 The price of Tether remained unchanged despite the large and small orders to buy or sell the coin on Kraken. The authors of the report had conducted an analysis on Kraken’s public order book, covering more than 56,000 trades placed on the digital asset platform between May 1 to June 22. The data was also shared with New York University Professor and principal at Global Economics Group Rosa Abrantes-Metz and former Federal Reserve bank examiner Mark Williams. Both economists concluded that something was going on at Kraken, per the Bloomberg report. 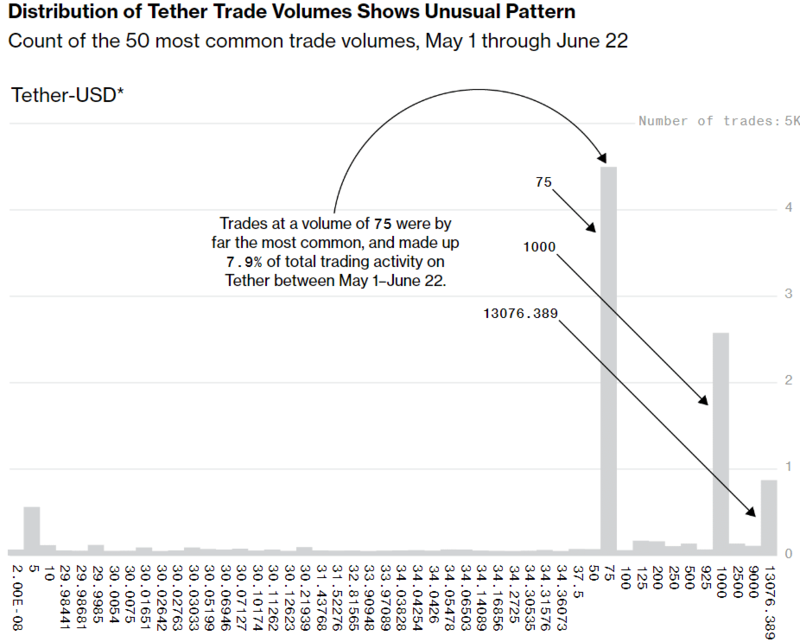 The report highlighted a trade for 13,076.389 Tethers, which it says is unusual as other orders go out to five decimal places. This particular trade had three decimal places, which Abrantes-Metz and Williams, suspected could be linked to automated trading programs. Sequel to Wells Fargo and Co’s decision early in 2017 to relieve itself of the role of a correspondent bank between U.S customers and Tether’s banks in Taiwan, Bitfinex also announced its decision to withdraw services rendered to U.S. customers due to the cost of operation. Subsequently, a lawsuit was filed against Wells Fargo by both Bitfinex and Tether, but the case was withdrawn when it seemed more controversies could burst their seams. Documents from the Wells Fargo lawsuit revealed the presence of four Taiwanese banks in the Bitfinex/Tether connection. However, the spokesperson for Bitfinex and Tether Ronn Torossian refused to identify the company’s’ current banks unless a non-disclosure agreement was signed by reporters who were interested in knowing them. The offer was subsequently declined. From media reports and documents posted online, Bitfinex was associated with Poland’s Bank Spoldzielczy in Skierniewice, but the authenticity of these documents was never confirmed, as Torossian declined to make comments. Efforts to verify the authenticity of these documents from the bank’s chief executive officer Wladyslaw Klazynski met a brick wall due to Polish Financial law that forbid persons revealing client data. Nevertheless, he was quoted to have maintained that his firm isn’t “financially engaged” with any company trading bitcoin. Furthermore, the administrative management and location of Bitfinex and Tether were not disclosed on their respective websites or in any public document. Leaked by the International Consortium of Investigative Journalists, these documents pointed to a graduate of Yale University Phil Potter as the director of Tether and the chief strategy officer at Bitfinex. His work experience began at Morgan Stanley as a derivatives analyst before proceeding to Bear Stearns Cos., where he worked on technology infrastructure and software design in the private client services unit. In 2013, Bitfinex was incorporated in Hong Kong but subsequently changed its name to Renrenbee Ltd a year later as revealed by Companies Registry in Hong Kong. Giancarlo Devasini is identified as a director at Renrenbee by Companies Registry. Implausibly, the Paradise Papers also identifies him as a Tether director, further confirming that both companies are not separate entities as we all think and are controlled by the same group of individuals. The CEO of an advertising technology company in Turkey Oguz Sedar saw it wise to shift his funds into tether after the feared a slump in bitcoin prices, which he had invested in. His solace had initially been on PayPal, but things went awry after Turkey banned PayPal in 2017. In November, his request to cash out $1 million of tether was refused. Holding onto the premise of being backed by reserves, Sedar sought to know whom Tether banked with, but the company declined to disclose its bank and instead recommended that he should make do with selling on one of the exchange partners listed on its website. He checked it out and over a dozen names appeared but only a few offered investors an avenue to exchange tether for dollars. Kraken was among the viable option, but Serdar was skeptical about their ability to handle his trade. As things turned out, Serdar was eventually flagged by Tether as suspicious because of the numerous irregularities he was supposedly involved in. Serdar relayed all that ensued to the U.S. Treasury Department and Justice Department through an online Tip website but is yet to get a response. Influential critics of Bitfinex and Tether accused both companies of running a fractional reserve scheme where reserves are only equal to a fraction of its deposit liabilities. Which implies that more USDT are issued than the acclaimed reserves in fiat dollars. This, according to critics is covered up through the inflation of Bitcoin prices to manipulate the market. Despite Tether’s self-reported finances which laid claims to excess-reserves coupled with its clean bill of health from the auditor statement in September 2017, critics remain skeptical about these findings. It is, however, plausible that an exchange of Bitifnex’s clout has an amount within the tune of a billion dollar and this is substantial enough to back Tether. Separating facts from fiction can be complex in cases like that of Tether. While it remains inconclusive, the case of Serdar is a grim reflection of Tether’s unreliability in USD convertibility. The company is not obliged to render service to customers that supposedly fall out of compliance. Following the fall out between Wells Fargo and Bitfinex in 2017, there was a sharp increase in the issuance of USDT. The increasing demand in Bitcoin was also noted as a factor that accounted for the USDT in circulation. In November 2017, Tether claimed $30.95 worth of tokens had been hacked. The post which was initially released on its website was subsequently deleted after it later claimed that it was in the process of recovering the token to ensure they do not penetrate the mainstream cryptocurrency market. Tether’s claim of decentralization has been put upon inquiry by the “quarantined” address above which contains the amount in hacked funds and frozen in place by the company. The U.S Commodity Futures Trading Commission on December 6 sent subpoenas to virtual-currency platform Bitfinex and Tether following inconclusive evidence of its holding to the public. While Bitfinex is not a U.S. based company, it has customers based in the U.S. The legal status of Tether has been a source of debate with many critics believing that it could face the sledgehammer of a U.S led shutdown according to Bittrex. There have, however, been no official comments from Tether or U.S Regulators, and this has also shrouded its operation in more controversy before the public. In September, the New York state approved the bid of two financial technology companies to issue cryptocurrencies pegged to the U.S. dollar enabling more regulated and transparent competition in the world of stable coins of which Tether seems to gain preeminence. Cameron and Tyler Winklevoss are the founders of Gemini Trust Co., the digital asset exchange that was approved by the New York Department of Financial Services to launch the Gemini dollar. In the same vein, a blockchain company catering to financial institutions was also approved to issue the Paxos Standard. Poised to douse the cloud of uncertainty that has darkened the use of stable coins, Tyler Winklevoss emphasized in his interview that Gemini dollar will offer more transparency to potential users than other stable coins. A spokesperson for the bank Kerri Doherty maintained that while the State Street Corp will not act as a custodian for any digital assets, it would hold the U.S. dollars backing the coin. Winklevoss added that the currency and its dollar reserves would be audited every month by San-Francisco based firm BPM to ensure they match. “We don’t think anyone is solving for the trust problem. Audits have been lacking in the market up to this point,” Doherty remarked in a phone interview. Gemini’s association with State Street, a bank with an international repute, dating back to the 18th century, may help address institutional lapses prevalent with stable coins. Gemini has also opened talks with Trail of Bits which conducted a review of the stable coin’s affiliated smart contracts on ethereum network, according to the digital security company’s chief executive officer, Dan Guido. According to Paxos Chief Executive Officer Chad Cascarilla, several Federal Deposit Insurance Corp-insured banks will hold the U.S. dollars backing the Paxos Standard (PAX). A large auditing firm will review the exchange’s stable coin. While Chad declined to provide the names of the banks, he noted that the auditor would be Withum. “The biggest thing this is doing is solving the plumbing issues in the crypto space. Our business is trust. We’re not just doing this off some very light forms of regulation,” Chad added. Paxos has been able to sell $63 million worth of its tokens so far. Backed by Y-Combinator, AnchorUSD is a crypto coin baked one-for-one by the U.S. Dollar. It holds all its deposits in US-domiciled bank accounts, which is why some users believe it has the edge over Tether and the rest of the stablecoins out there. 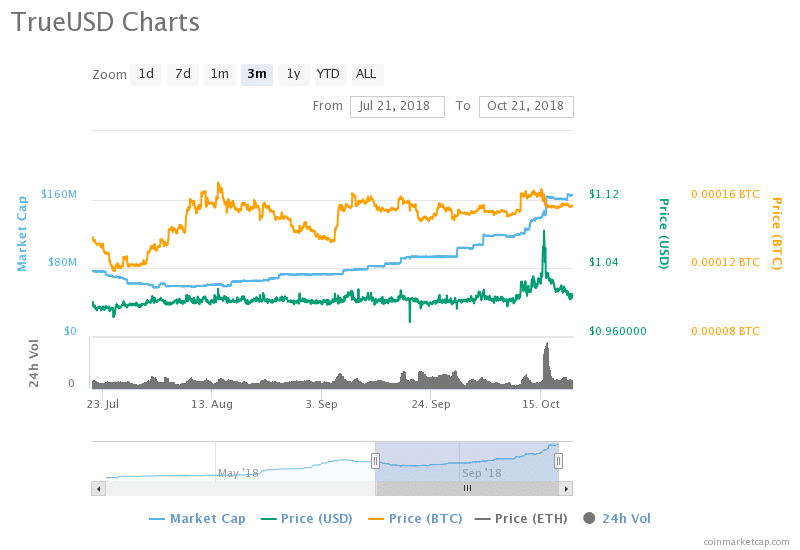 AnchorUSD leveraged Tether after it began to build on Stellar. Having assured potential investors of regular audits, many believe that the security of their funds is better guaranteed. Prequel to AnchorUSD was the White standard (WSD) which was also launched on the Stellar Network. In August, the White Company in collaboration with Fintech Ltd announced a partnership bringing USD, GBP and Euro fiat deposits and withdrawals via White Standard stable coins. Fintech’s Interstellar Decentralized Exchange (DEX) platform was the first Stellar DEX-based exchange and wallet that began the provision of this service two months ago. Fully-backed by deposits that are audited every month by the third party, WSD provides instant and efficient transactions and easy integration into the existing stellar ecosystem and the Stellar DEX. TrueUSD was launched in January 2018, marketing itself as “a USD-backed stablecoin you can trust.” Conceived by Trust Token, many believed that it learned from the mistakes of Tether and will not want to be seen in the same light as its most prominent predecessor. This should explain why it emphasizes “full collateral, regular auditing, and legal protections.” Full KYC is required before TUST can be purchased directly from TrueUSD. Although TUSD could drift slightly in price, the chances of deviating far from the $1 peg are improbable. Before Tether got shrouded in its latest series of controversies with U.S. Federal Regulators, several exchanges relied heavily on Tether. Many began to contemplate a second option for fear of an imminent crackdown on the stablecoin. In March 2018, Bittrex added TrueUSD as its second stable coin in a ploy regarded as a hedge against the consequences that may befall Tether. While Tether was covered with controversies, TrueUSD positions itself as a safer belt. While tether was launched on the Omni Layer, TrueUSD runs on the Ethereum blockchain. According to the company’s official announcement at the time, once users send in their fiat, the money is kept in an escrow that they can access and reclaim at any time. In the first 24 hours after it was listed, $2.3 million of TUSD was traded on Bittrex which accounted for 56% of the dollar-pegged coin’s overall volume. Following the spate of controversies that have trailed Tether of late, Digifinex replaced the popular USDT with its primary rival, TrueUSD in September, per a CoinDesk report. Within the first 24 hours after the replacement, Digifinex handled operation close to $131 million in trading volume. The co-founder of Digifinex, Kiana Shek admitted that she had been seeking avenues to part ways with USDT. She, however, maintained that her stance was not a covert support for other tokens. Going further on her decision to find an alternative to tether, she gave a grim reflection of the team’s decision to comply with regulations stipulated by the U.S Financial Crimes Enforcement Network (FinCEN). On Tuesday, October 16, 2018, Tether withdrew 250 million USDT out of circulation after an initial 50 million USDT and 200 million USDT were sent to Tether’s treasury address by Bitfinex. 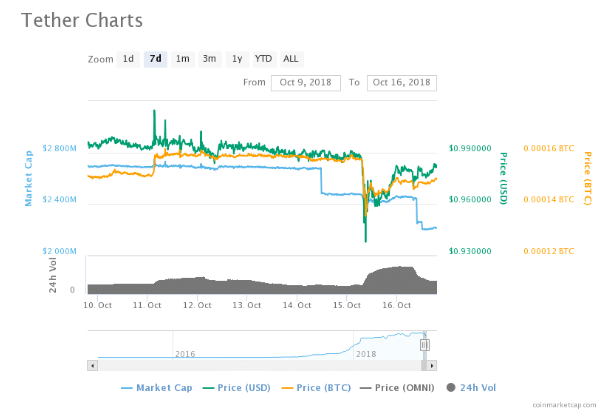 In total, Tether has retired $740 million USDT so far in October. $100M, $200M, $200M, $50M, $50M, $10M, $80M, $50M for a total of $740M. Could these ridiculous withdrawals portend a stablecoin arbitrage? 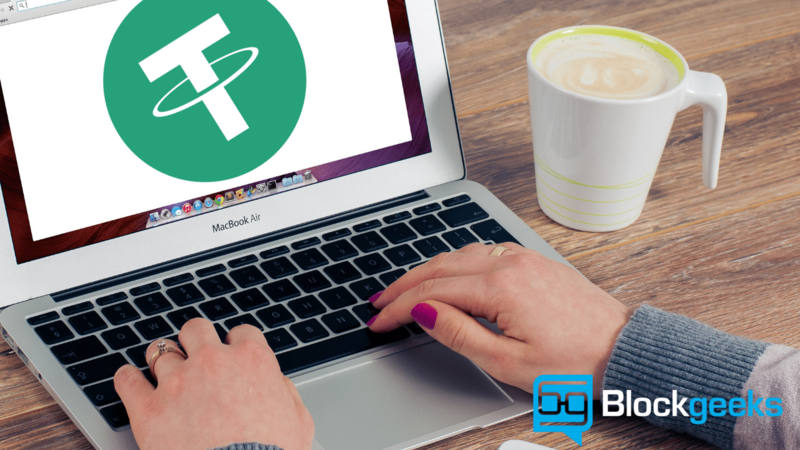 Some analysts believe that Tether is purchasing USDT on the market for a discount and attributing the $1 to itself. There is nothing unscrupulous about it, and it can be compared to a public limited liability company buying back company shares when it feels its fair price is not in proportion to the value the market attributes to them. While the market is littered with “non-Tether” arbitrageurs, a large portion of the buyback will still be credited to Tether. At the current discounted price of 3-5% of its traded price, Tether could net between $18 million and $30 million for the buyback. The current slip in price points to the market considering holding Tether too risky that they demand a 3-4% discount on its price for holding it. Tether, on the other hand, is incentivized to keep buying back USDT and redeem them for U.S. dollars. Tether’s heralded fortune nosedived almost by 25 percent within the space of two months. In August 2018, the USD-pegged token had a current valuation in the tune of $2.8 billion, but things have fallen apart ever since then leaving the worth at just $2 billion. A significant chunk of the decline was ascribed to the slump in the price of USDT which went below the $1.00 in assets supposedly backing each token in circulation. The slip had sent shivers into the market that puts so much reliance on billions of dollars worth of tether being traded daily on exchanges. 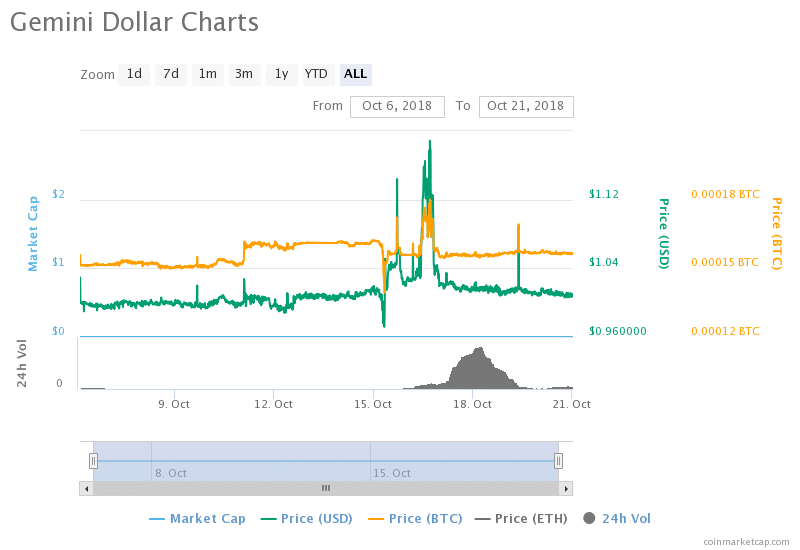 As at Monday, October 15, 2018, the global average price of Tether traded as low as $0.92 but improved afterward to $0.98. The thinly-traded USDT/USD market offered on Kraken slumped to as low as $0.85 before reaching a going back to $0.95. There was so much ado surrounding Tether after it was subpoenaed December 2017. The speculations drove uncertainty on several platforms trading with it and investors became hesitant as a result. In spite of the odds witnessed in the last months, Tether seemed to have weathered the storm with roads still to be crossed. The subpoenas of companies that have their presence felt in the economic sphere of the US is a common practice carried out by regulators. A writ meant to compel testimony is no proof of an imminent shutdown and neither does it say that the regulators can not exercise extant prerogatives in sanctioning transfers carried out in U.S. Dollars. While weighing the odds against potential inroads, Tether remains shrouded by a trail of statutory measures that could thwart its continuity in the nearest future. The company remains an unregulated exchange, and its manner of operations underscores a significant reason why cryptocurrency exchanges are separated from the conventional banking system. Among the well-orchestrated face-saving attempts was the hard fork implemented to blacklist stolen funds amounting to 30 million tethers. There are still a good number of exchanges using the token to enable traders to take a cash position before embarking on a trade. The over-reliance on this token portends excellent threats to the entire crypto industry with the burgeoning market cap. Thus, its feasibility in the long-term remains a matter worthy of introspection. The resulting system perpetrated with the use of Tether is fraught with flaws and grave consequences. The traditional transparent cryptocurrencies such as Bitcoin and Ethereum are converted into private SQL balances requiring the mutual trust of the customer. Even with such a system, exchanges can be lured by the available incentive for fraud. Exchanges may decide to manipulate balances as they so please and it is cumbersome to secure their crypto holdings. They have unsavory antecedents of their crypto being stolen or seized, and affected customers have had to bear the brunt. Going by this rationale, Tether will perhaps, stand as the metaphor for a weak system. If centralized exchanges have their fair share of vulnerability, Tether has a more complicated weakness with consequences that will reverberate on exchanges even if they maintain a well-streamlined operation. Suffice it to say that the system in its entirety and the players within it needs to learn from past lapses and better make do with the frailties of centralization and the lack of transparency therein. If centralized, opaque exchanges like Polonies, Bitfinex, and Coinbase are susceptible to data loss, fraud and hacks and with customers forfeiting their funds with no recourse, what will make a system like Tether immune? We often tend to develop amnesia for the past, and if some would prefer to watch proceedings play itself out, there are those who will always dredge up the past for the sake of posterity. The experiment with self-issued currency without any government approval is no novel gamble to those who can remember the ‘Liberty Reserve’ craze. The Costa-Rican based centralized digital currency had the self-acclaim of being the “oldest, safest and most popular payment processor serving millions all around the world.” By the time the U.S prosecutors shut down its site alleging money laundering and the provision of unlicensed financial services, it already had over one million active users. Many of them bore the brunt when Prosecutors swept into action in 2013. Similar to the path being towed by Tether, Liberty Reserves had its operations centralized, and this was the center of gravity that brought it crashing like the proverbial ‘Humpty-Dumpty.’ Satoshi Nakamoto, the founder of Bitcoin, took a cue from the flaws that occurred three years before he created the cryptocurrency that is now the most popular today. Many would have gambled that Tether would not survive into the fourth quarter of the year, but here it is. That notwithstanding, it is a sitting duck for the U.S. regulators if, in any event, they decide to take actions on alleged cases of money laundering. This is a charge that can be leveled against any financial company regardless of the extent of culpability. Tether’s dependence on a formal banking arrangement is even more of a puzzle that will open a can of controversies if delved into it any further. Summing it all, the overpowering threats are way beyond any strength that has made it popular since it came into operation.